Kalandra Jane - Millinery and Musings! 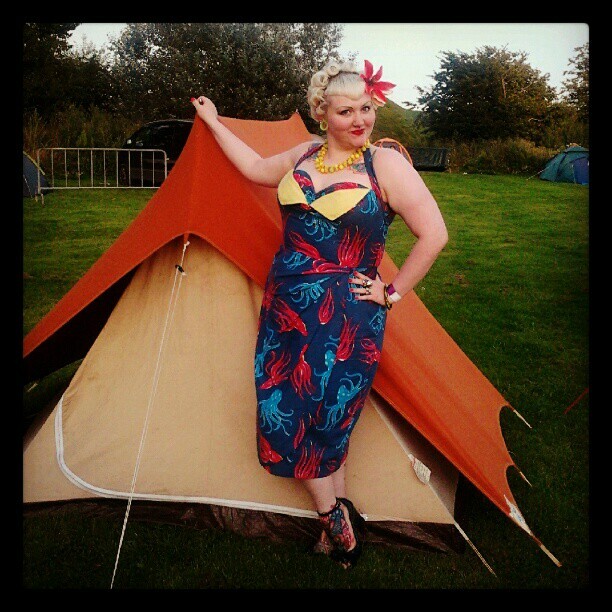 : What I did on my Summer Holidays: Kustom Kulture Blastoff! What I did on my Summer Holidays: Kustom Kulture Blastoff! 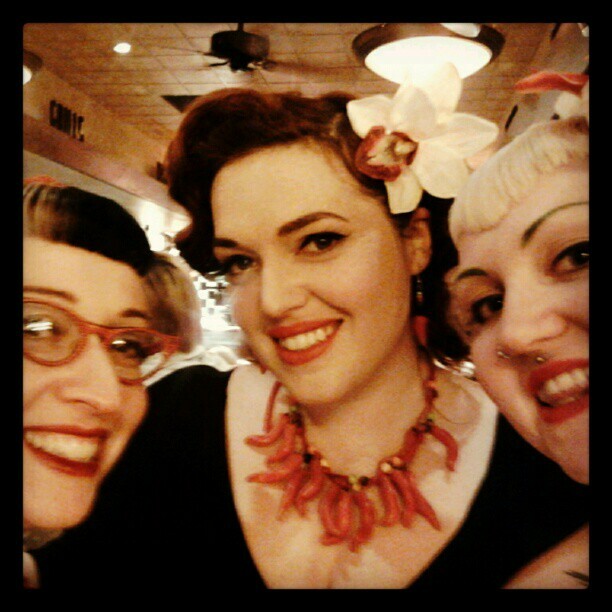 A few weeks ago Clare, Bethany and I packed up our little stalls and headed off to the arse end of nowhere (a.k.a. 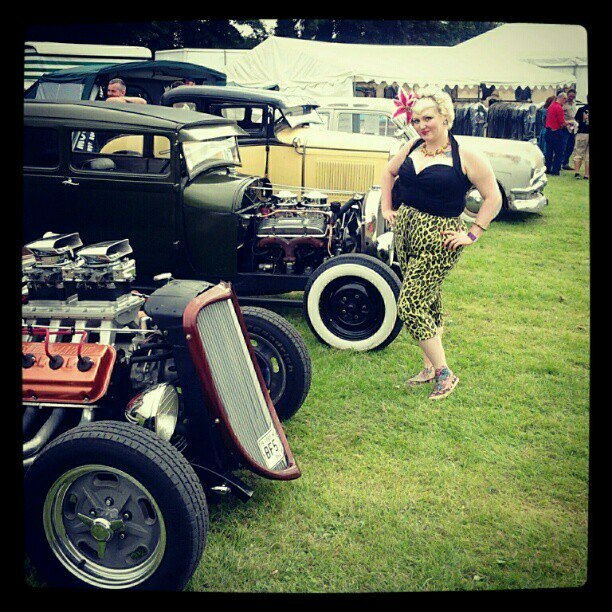 Spalding, Lincolnshire) for the 3rd Kustom Kulture Blastoff. I managed to put up my 'vintage' (ahem hem) bright orange boyscout tent in what was possibly record time before it started raining. We lived in our tents for the weekend, and I didn't always look this well put together! Thank you Clare for waking me up with a delicious brew each day and putting up with my terrible morning moods (ie. grumpy hangovers)! I didn't sell that much, and it was all a bit quieter than expected really. 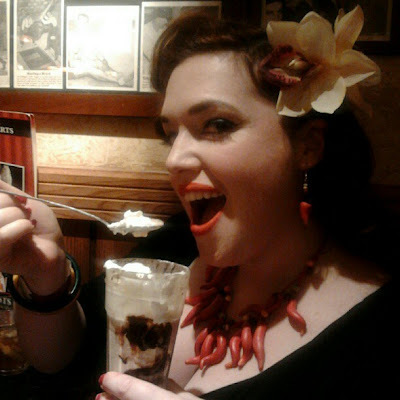 I spent most of my profits on feeding myself over the weekend, and on a couple of treats. 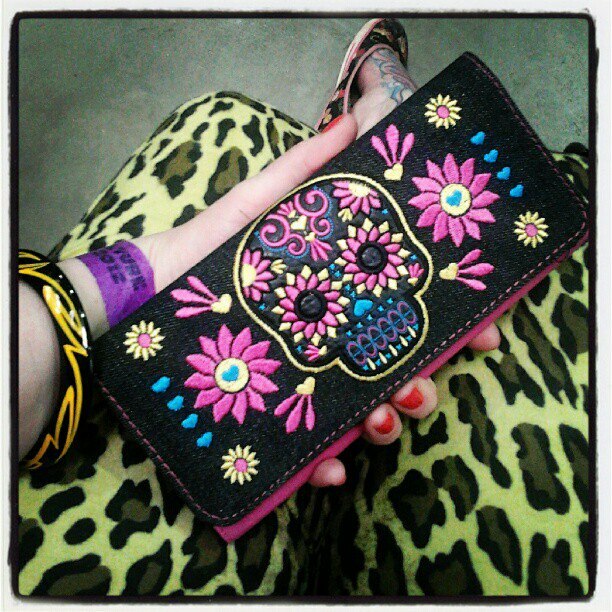 I got a new wallet from Hot Rockin' Belle (who will soon be stocking my hats!) to replace my decrepit Bettie Page one, and a very reasonably priced new bangle from Kool Kat pinstriping, I also got a super cool hip flask from him but I forgot to photograph it. It was dark and freezing at night in our tents, and the organisers wanted to charge the traders extra to get into the evening entertainment, so we spent most of our time gossiping over jugs of sickly cocktails at Frankie and Benny's, which was the only eating establishment within walking distance. We got free cocktails at the bar because the new barman didn't know what he was doing! Hurrahs! Helium was sucked from balloons! (Especially hilarious when you are full of terrible gin cocktails). Ice cream sundaes were eaten sexily! Upon returning from the restaurant we snuggled down for girly wine time in my tent, but not before wandering into a Si Cranstoun performance which was full of dodgy old blokes who had just come for the evening gig, jiving to music so clean and sanitised it made me want to punch someone in the face then smear my body with their spurting nose blood just to dirty myself back up a bit. The fantastic Vince Ray and the Boneshakers had been booked and would have saved our starving musical souls, but they sadly had to pull out at short notice. Needless to say, we were unimpressed by the "rockin'" Michael Bublé soundalike, and I think that considering it's supposed to be a Kustom Kulture event, they should look into booking some acts and having some DJs that play something with a bit of an edge. 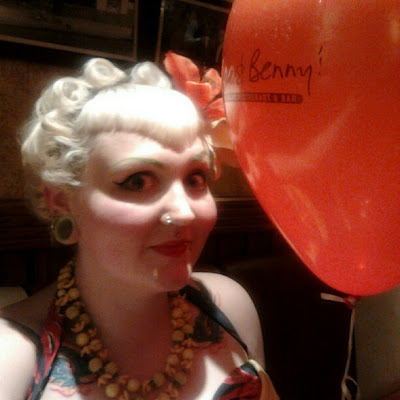 The daytime event was full of tattooed hot rodders, vintage lovers and psychobillies, all of whom ended up in the pub with us both nights because the evening entertainment was, shall we say, not their cup of tea. Anyway! Beth and I wandered out on the Sunday for a bit of ridiculous car show posing, as is traditional at these events. I made the top and lime green leopard capris, unfortunately I was feeling pretty bloated and grim this day, hence my slouchy, rotund appearance. Finally it was time to leave, so Clare and I trundled off through the cabbage fields and into the sunset. 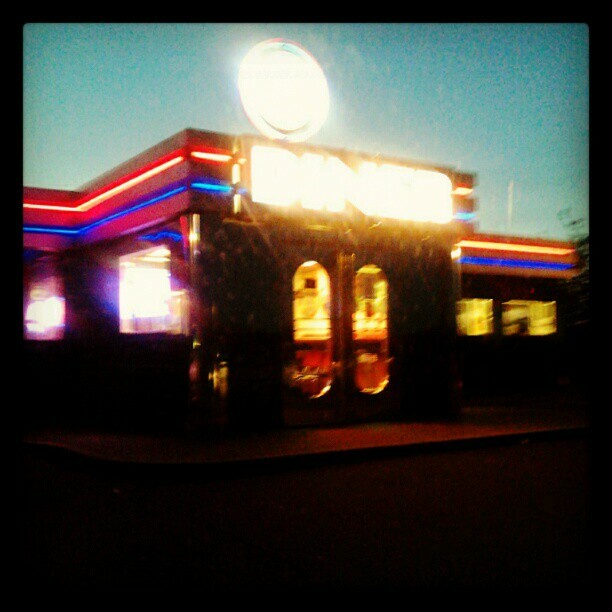 On our way home we stopped in at the OK Diner at Carlton on the A1, and were really glad we did! O, shining beacon of delight! 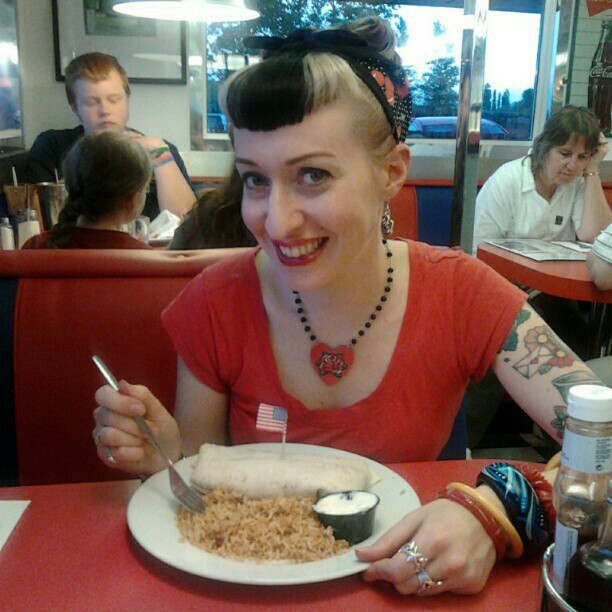 Clare had a lovely veggie burrito with Mexican rice! 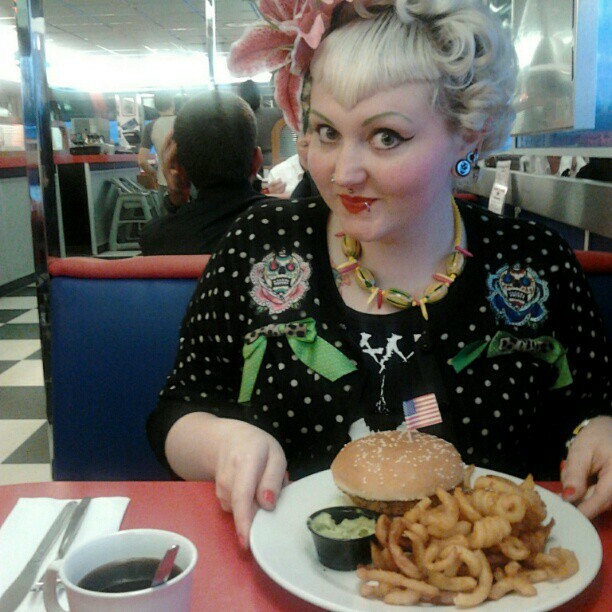 I had a spicy beanburger with curly fries and guacamole! Our waitress was an absolute star, running back and forth getting me ingredients lists and checking things were vegan for me. It was a lovely surprise to be able to actually get a decent vegan meal at a roadside restaurant, I just wish there was an OK Diner closer to where I live! I also got an amazing pink double hair lily, which Paul says makes me look like Jodrell Bank. All in all I had a really good weekend, despite not having made huge profits and having been forced to listen to the Big Bopper over and over again until I wanted to stab myself in the ears, I loved spending time with two of my favourite ladies, making some new contacts and getting to gab over cocktails! Your dress in the first picture is really stunning, did you buy it or make it yourself? If you did, would you mind me asking were you got the octopus fabric? It's really awesome! And your leopard capris are great too! I made it, the fabric was from eBay, there's a lobster one and a shark one by the same company, although I can't remember who makes it! I'm pretty sure it's still in print though. Well then, I wish you the best of luck with your future dressmaking business!Your hats and fascinators are arleady awesome, and from what I've seen on your blog, I guess the clothes you'll make will be juste the same! Winning! Manchester Vintage Awards 2012. I dyed my hair a ridiculous colour!